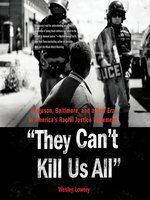 The first book to go behind the barricades of #blacklivesmatter to tell the story of the young men and women who are calling for a new America.In a closely reported book that draws on his own experience as a young biracial journalist, Washington Post reporter Wesley Lowery tells the story of the year that shook America. From the killings of Trayvon Martin in Sanford, Florida and Mike Brown in Ferguson, Missouri to the death of Freddie Gray in Baltimore, Maryland, with a stop in Selma, Alabama along the way, Lowery takes readers to the front lines of history as it unfolds. The repercussions of police violence have sent citizens into the streets proclaiming that Black Lives Matter and politicians scrambling for a new way of understanding the basic social contract between the governed and those who govern.With bracing intensity and incredible access, Lowery examines the economic, political, and personal histories that inform this movement, and place what it has accomplished—and what remains to be done—in the context of the last fifty years of American history. 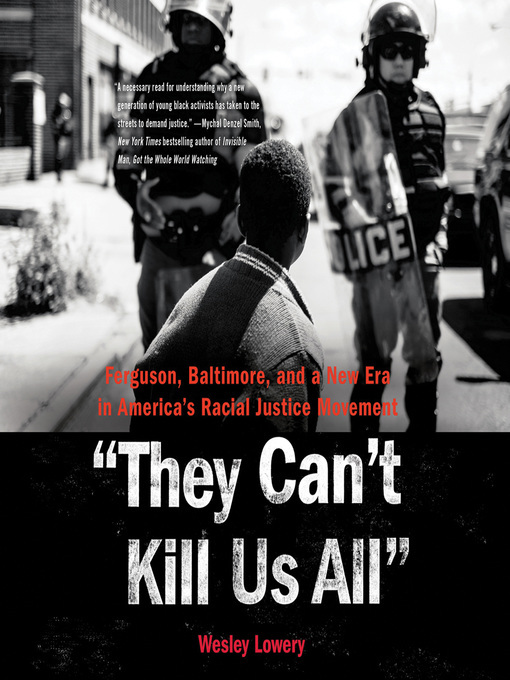 By also telling the story of his own life growing up biracial in Cleveland, Ohio, the son of a black journalist, he will explain the roles that hope and optimism play in shaping one's own identity.They Can't Kill Us All is a galvanizing book that offers more than just behind-the-scenes coverage of the story of citizen resistance to police brutality. It will also explain where the movement came from, where it is headed and where it still has to go. Wesley Lowery is a national reporter for the Washington Post who covers law enforcement and justice. He was the paper's lead reporter in Ferguson, Missouri, and covering the Black Lives Matter protest movement and was a member of the team awarded the 2016 Pulitzer Prize for National Reporting for the paper's coverage of police shootings. His reporting has previously appeared in the Boston Globe, Los Angeles Times, and the Wall Street Journal. Digging beneath the news headlines of police killings and protests, Lowery’s timely work gives texture and context to a new era of African-American activism. Lowery, a young black Washington Post journalist with a bit of street cred after being arrested during a protest in Ferguson, Mo., found himself at the middle of the burgeoning Black Lives Matter movement. Though Lowery shares his personal and familial experiences with race, he is a reporter at heart, focusing on the stories of activists behind the protests. One of his most vivid subjects is Netta Elzie, a social media–savvy St. Louis native. As Lowery writes, she was already devastated by a beloved friend’s unresolved killing by police when she first learned of Michael Brown’s killing. She went to the scene and became a “chief on-the-ground correspondent” in Ferguson. Another strong voice in the book belongs to Bree Newsome, an NYU film school alum, who was politicized by the slaying of Trayvon Martin and first expressed her activism in voting rights advocacy in her home state of North Carolina. She came to public attention when, following the killing of parishioners of Emanuel AME Church in Charleston, she removed the Confederate flag displayed at the South Carolina statehouse in protest. Through their stories and those of others, Lowery conveys the shape and direction of a national movement. Agent: Mollie Glick, CAA.